It was a scene that was never experienced in any of the previous annual events of Indian Institute of Technology (IIT), Kharagpur. As the countdown came to this day, by early evening, a long queue of thousands of students of IIT joined by many from other institutes from across the country awaited the stadium doors to open. Soon the Tagore Open Air Theater, popularly known as the TOAT was filled with over six thousand people - all awaiting the laser magic of Manick Sorcar, first time ever to be experienced in Kshitij, the annual mega-event of IIT, Kharagpur. Kshitij 2006, as they called this year's event, was the largest and it was a joint effort by the students and faculty members of all technical departments, hosting a galaxy of events aimed at boosting the technological and managerial skills inherent in today's youth. It provided a chance for the students to meet and think over what new can be pursued in the field of technology and management. Sorcar's laser show was scheduled to start at 7:30 PM. But due to slight delay in the arrival of a few key guests, and in controlling the long queue of people entering the stadium, the show was started at 7:45 PM. A thundering applause and roaring cheers from the audience welcomed Manick Sorcar as he was introduced by Sanchayan Chakraborty, the General Secretary of Kshitij 2006. 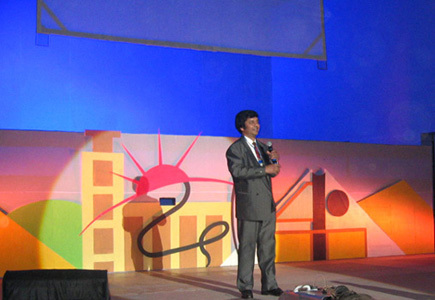 After a short introductory speech Sorcar started his show "Horizon and Beyond". 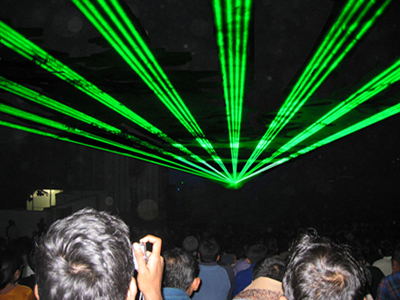 "Horizon and Beyond" was an extravaganza of laser graphics, overhead laser spectacles, which ran for 22 minutes simultaneously with intelligent lighting coordinated with its story and background music. It was a techno-flavored history of India which started from 2500 BC and took the audience to 2006 and beyond. As a part of the history the audience also saw how IIT, Kharagpur, the first Indian Institute of Technology had its humble commence over fifty years ago and flourished over the years to be acclaimed as one of the greatest in the world today. Each of the milestones, flagged with three-dimensional overhead laser spectacles and on-screen graphics was warmly cheered by the packed stadium. The audience enjoyed every scene "as a thrill of my life", as expressed by one of the spectators later, "this was an unforgettable experience". 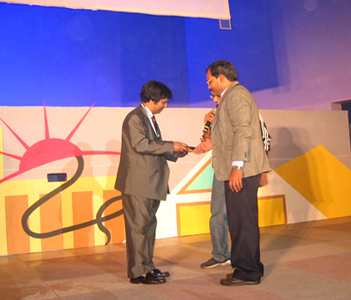 After the show, Manick Sorcar was congratulated on stage and honored with a plaque on behalf of the students and the faculty, by Professor Sunando Das Gupta, Co-chairman of Kshitij 2006. At the guest-dinner following the show, Manick Sorcar was warmly congratulated by the Guest of Honor 'Padma Vibhushan' Dr. R. Chidambaram, Principal Scientific Adviser to the Govt. of India and DAE - Homi Bhabha Professor, "I have seen your father's magic show many years ago. Now I saw your magic presented through laser technology - it was simply spectacular", he said. Professor B. K. Mathur, Head of the Department of Physics & Meteorology of the I.I.T. greeted Sorcar, "Absolutely impressive! I am still wondering how you managed the laser to do those fascinating waves overhead! "; he warmly invited Manick to visit his laser laboratory. Sorcar was also congratulated by Professor Jacky Baltes from the University of Manitoba, Canada, Dr. Farrokh Mistree, professor in Woodruff School of Mechanical Engineering in Georgia Institute of Technology, I.I.T. 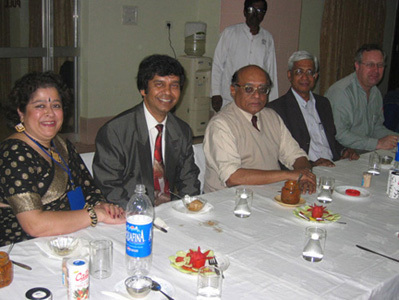 Prof. M. Chakraborty, Dean of Alumni Affairs and the others. "This was exactly what we were expecting to happen", said a jubilant Debjit Mandal, one of the Heads of the Core Team, Kshitij 2006, "this year's festival is the largest. We wanted the mega-event to start with a mega-show and a mega-response - and that's exactly what we got. We thank you Mr. Sorcar". "... It was a great pleasure to meet you, partly because you are your father's son and more because you are you .. to see your patriotic laser animation show and to hear about your work. You have successfully brought together art and science in a very original way. I wish you success in your further endeavours and hope to meet you and see your show again in the future."